Do Not Call: Google spam filter wins FTC robocall challenge. 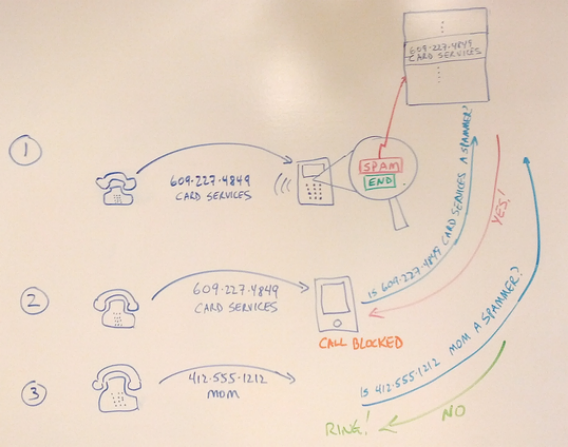 A back-of-the-envelope diagram of Google’s proposed solution to robocalls. Remember the Do Not Call list? Or the 2009 federal rule that was supposed to stop robocalls? Odds are they haven’t stopped your phone from ringing regularly with maddening automated requests from “Rachel from cardholder services.” But perhaps technology can. That was the theory behind the Federal Trade Commission’s “Robocall challenge,” a call to the public to come up with technological solutions to the phone-spam problem. The FTC says it receives some 200,000 complaints every month about robocalls—more than it gets on any other subject. Caller-ID spoofing technology has allowed shady telemarketing services to illegally blast millions of people with automated calls, which are often scams. The Robocall challenge was an effort to fight tech with tech. On Tuesday the FTC announced three winners: two individuals, who will split a $50,000 prize, and a third entry from Google engineers that won in a separate category for companies with more than 10 employees. Google won’t get any money, but its solution might be the most robust of the three, if not the most creative. The proposal, from Google engineers Daniel Klein and Dean Jackson, would crowd-source spam reports to build a real-time database of phone numbers from which robocalls are originating. After a few reports on the same number, algorithms would identify it and block or otherwise flag it for all future callers. That sounds relatively low-tech, but the key is speed. Robocalling systems work too fast for most manual reporting systems to respond to effectively. But if Google or another provider could implement it in a way that makes reporting spam quick and easy, with a single button—like it is for email—and updates the database instantly, it could theoretically block a substantial proportion of unwanted calls. Of the two winning individual entries, one, from a man named Serdar Danis, would rely on algorithms to recognize caller-ID spoofing. The other, from Aaron Foss, is more imaginative. Called “Nomorobo,” Foss’s solution would set up a cloud-based “simultaneous ringing” service that would use a virtual second phone line to identify and hang up on robocalls before you could answer them. The FTC won’t implement any of the ideas on its own. Instead, it will rely on the private sector to develop these and other potential solutions. Does that mean Google could end up in charge of spam filtering for our phone lines? I’ve asked Google for comment and will update when they respond. What do you think: Could these actually work? Or is there a better way to rid yourself of this 21st-century scourge?